The Department for Education publishes an annual report on exclusions, the latest edition published in August 2018 being ‘Permanent and fixed-period exclusions in England: 2016 to 2017. The 2018 report shows that the overall rate of permanent exclusions was 0.1 per cent of pupil enrolments in 2016/17. The number of exclusions was 7,720. The report also goes into more detail, for example…. The vast majority of exclusions were from secondary schools >85% of exclusions. Physical assault against an adult. Black Caribbean pupils had a permanent exclusion rate nearly three times higher than the school population as a whole. The ‘reasons why’ and ‘types of pupil’ data probably hold no surprises, but NB there are quite a few limitations with the above data, and so these stats should be treated with caution! According to this Guardian article, the figures do not take into account ‘informal exclusions’ or ‘off-rolling’ – where schools convince parents to withdraw their children without making a formal exclusion order – technically it’s then down to the parents to enrol their child at another institution or home-educate them, but in many cases this doesn’t happen. According to research conducted by FFT Education Datalab up to 7, 700 students go missing from the school role between year 7 and year 11 when they are supposed to sit their GCSEs…. Equivalent to a 1.4% drop out rate across from first enrolment at secondary school to GCSEs. Datalabs took their figures from the annual school census and the DfE’s national pupil database. The cohort’s numbers were traced from year seven, the first year of secondary school, up until taking their GCSEs in 2017. Just under 4,000 were enrolled or sat their GCSEs at a variety of other education institutions. Leaves between 6,000 to 7,700 former pupils unaccounted for, who appear not to have sat any GCSE or equivalent qualifications or been counted in school data. Working out the percentages this means that by GCSEs, the following percentages of the original year 7 cohort had been ‘moved on’ to other schools. 6% or 32, 000 students in all, 10, 00 of which were moved to ‘state funded alternative provision, e.g. Pupil Referral Units. 4%, or 7, 700 cannot be found in any educational records! This Guardian article provides a decent summary of the research. There is very little detail on why pupils were excluded, other than the ‘main reason’ formally recorded by the head teacher in all school. There is no information at all about the specific act or the broader context. Labelling theorists might have something to say about this! There is a significant time gap between recording and publication of the data. This data was published in summer 2018 and covers exclusions in the academic year 2016-2017. Given that you might be looking at this in 2019 (data is published annually) and that there is probably a ‘long history’ behind many exclusions (i.e. pupils probably get more than one second chance), this data refers to events that happened 2 or more years ago. This is of obvious relevance to the education module… it might be something of a wake up call that 4% of students leave mainstream secondary education before making it to GCSEs, and than 1.4% seem to end up out of education and not sitting GCSEs! It’s also a good example of why independent longitudinal studies provide a more valid figure of exclusions (and ‘informal’ exclusions) than the official government statistics on this. I’ll be producing more posts on why students get excluded, and on what happens to them when they do and the consequences for society in coming weeks. This is a topic that interests me, shame it’s not a direct part of the A level sociology education spec! Taking news for example, there are thousands of news items published every day. You also need to distinguish between ‘real and ‘fake news’. Also, in the postmodern age where fewer people get their news from mainstream news it is necessary to analyse a wide range of media content to get representatives, which makes this more difficult. Because there are so many documents available today, it is necessary to use computer assisted qualitative analysis, which effectively quantifies the qualitative data, meaning that some of depth and insight are lost in the process. Personal diaries are one of the most authentic sources of information because people write them with no intention of them being seen. However, they may not be willing to show researchers the content because they say negative feelings about people close to them, which could harm them. Blogs would be easier to access but the problem is people will edit out much of what they feel because these are published. Official Statistics are a quick and cheap means of accessing data relevant to an entire population in a country. They are cheap for researchers to use because they are collected by governments, who often make them available online for free—for example, the UK Census. Marxists might point out that the fact they are free enables marginalised groups to ‘keep a check on government’. Official statistics are a very convenient way of making cross national comparisons without visiting other countries. Most governments in the developed world today collect official statistics which are made available for free. More and more governments collect data around the world, so there is more and more data available every year. The United Nations Development Programme collects the same data in the same way, so it’s easy to assess the relationship between economic and social development in a global age. Analysis/ development – Deviant and criminal groups may be unwilling to allow researchers to gain access because they may fear prosecution if the authorities find out about them. Analysis/ development – some groups may be unwilling to take part in research because of social stigma. Analysis/ development – the characteristics of the researcher may exacerbate all of this. Analysis/ development – A further problem, is that if all of the above are problems, the research is very unlikely to get funding! Analysis/ development – gaining access can take a long time, especially with covert research. Analysis/ development – even with overt research, gaining trust, getting respondents to feel comfortable with you can take months. Analysis/ development – Some Participant Observation studies have taken so long that the findings may no longer be relevant—e.g. Gang Leader for a Day. A model answer to a possible 10 mark question which could appear on the AQA’s A-level papers 1 or 3. If you’re a bit ‘all at sea’ with Intrepretivism, you might like to review your understanding of it first of all by reading this post: social action theory: a summary. NB Warning – this is total overkill and probably completely unrepresentative of what 95% of actual A-level students are capable of producing. The first reason is that Interpretivists believe that social realities are complex, and that individual’s identities are the results of 1000s of unique micro-interactions. For example, labelling theory believes that students fail because of low teacher expectations, and these expectations are communicated to students in subtle ways over many months or years, until a student ends up with a self-concept of themselves as ‘thick’. There is simply no way that quantitative methods such as structured questionnaires can capture these complex (‘inter-subjective’) micro interactions. In order to assess whether labelling has taken place, and whether it’s had an effect, you would need to go into a school and ideally observe it happening over a long period, and talk to students about how their self-perceptions have changed, which would require qualitative methods such as unstructured interviews. Alternatively you could use diaries in which students document their changing self concept. A further reason why qualitative methods would be good in the above example is that you could, as a researcher, check whether teachers do actually have negative perceptions of certain students (rather than it being all in the student’s minds) – again qualitative methods are vital here – you would have to probe them, ask them testing questions, and look for body-language clues and observe them interacting to really assess whether labelling is taking place. It would be all too easy for a teacher to lie about ‘not labelling’ if they were just filling out a self-completion questionnaire. A second reason Interpretivists prefer qualitative methods stems from Goffman’s Dramaturgical Theory – People are actors on a ‘social stage’ who actively create an impression of themselves. Goffman distinguished between ‘front stage’ performances of social roles and the ‘back stage’ aspects of life (at home) where we are more ‘true to ourselves’. Goffman argued that some people put on ‘genuine performances’ – e.g. one teacher might really believe in teaching, and genuinely care about their students – their professional role is who they ‘really are’. Others, however, put on what he calls ‘cynical performances’ – another teacher, for example, might act like they care, because their school tells them to, but behind the scenes they hate the job and want to do something else. A Qualitative method such as participant observation would be pretty much the only way to uncover whether someone is genuinely or cynically acting our their social roles – because the flexibility of following the respondent from front stage to back stage would allow the researcher to see ‘the mask coming off’. If you just used a questionnaire, even a cynical teacher would know what boxes to tick to ‘carry on the performance’, and thus would not give you valid results. The ‘applied methods*’ question appears in paper 1 of the AQA’s Education with Theory and Methods exam (paper 7192/1). This is out of 20 marks, and students are expected to apply their understanding of any of the six main research method covered in the A-level sociology specification to any conceivable topic within education. Firstly, I get students to talk through the theoretical practical and ethical strengths and limitations just of the method. I do this because students need to know they method anyway, and they can get 10/20 just for writing a decent methods essay (without applying it) – see the mark scheme here. Students brainstorm the general ethical, practical and theoretical issues you may encounter when researching this topic with this method… I think it’s good to be as open-minded as possible early on… It’s easiest just to get them to do this on paper. I use an A3 sheet for this, with the item and question in the middle, students now read the item. Here I get students to add in analysis and evaluation points to each original lead-point, showing a chain of reasoning (side 2 of A3 sheet). DO NOT go over the whole process again, once is enough! There’s a very real possibility that students will just not ‘get it’, because they have to be so nit-pickingly overt about relating the method to the specific topic. Drilling this into students is a painful and thankless task, induced solely by the demands of this specific form of the assessment. There is also the possibility that students may lose the will to live, especially when some past papers have examples that even I find intolerably dull, and I’m actually interested in this stuff! *These are sometimes referred to as ‘Methods in Context’ questions. This was the term originally used by the AQA for many years, but (much like this question format itself as a means of assessing application skills) it’s pretty clumsy, so the new ‘applied methods’ phrase is IMO much better. Validity refers to the extent to which an indicator (or set of indicators) really measure the concept under investigation. 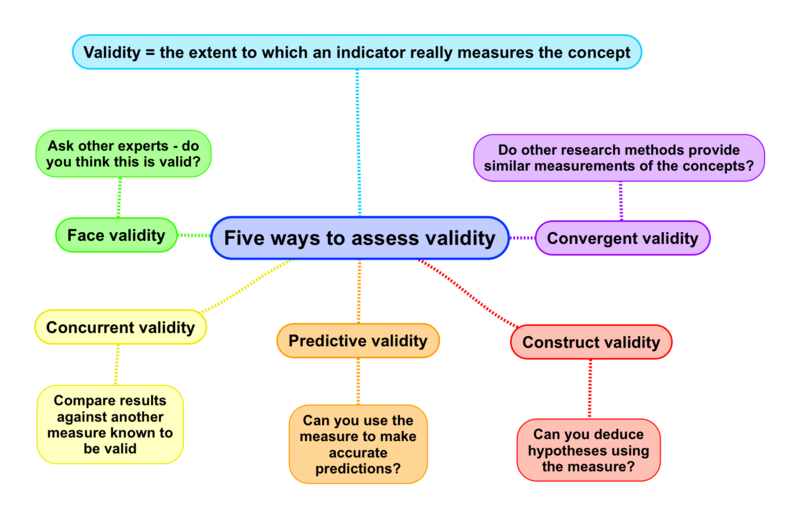 This post outlines five ways in which sociologists and psychologists might determine how valid their indicators are: face validity, concurrent validity, convergent validity, construct validity, and predictive validity. When universities question whether or not BTECs really provide a measure of academic intelligence, they are questioning the validity of BTECs to accurately measure the concept of ‘academic intelligence’. When academics question the validity of BTECs in this way, they might be suspicious that that BTECs are actually measuring something other than a student’s academic intelligence; rather BTECs might instead actually be measuring a student’s ability to cut and paste and modify just enough to avoid being caught out by plagiarism software. If this is the case, then we can say that BTECs are not a valid measurement of a student’s academic intelligence. How can sociologists assess the validity of measures and indicators? Face validity – on the face of it, does the measure fit the concept? Face validity is simply achieved by asking others with experience in the field whether they think the measure seems to be measuring the concept. This is essentially an intuitive process. Concurrent validity – to establish the concurrent validity of a measure, the researchers simply compare the results of one measure to another which is known to be valid (known as a ‘criterion measure). For example with gamblers, betting accounts give us a valid indication of how much they actually win or lose, but wording of questions designed to measure ‘how much they win or lose in a given period’ can yield vastly different results. Some questions provide results which are closer to the hard-financial statistics, and these can be said to have the highest degree of concurrent validity. Predictive validity – here a researcher uses a future criterion measure to assess the validity of existing measures. For example we might assess the validity of BTECs as measurement of academic intelligence by looking at how well BTEC students do at university compared to A-level students with equivalent grades. Construct validity – here the researcher is encouraged to deduce hypotheses from a theory that is relevant to the concept. However, there are problems with this approach as the theory and the process of deduction might be misguided! Convergent validity – here the researcher compares her measures to measures of the same concept developed through other methods. Probably the most obvious example of this is the British Crime Survey as a test of the ‘validity’ of Police Crime Statistics’. The BCS shows us that different crimes, as measured by PCR have different levels of construct validity – Vehicle Theft is relatively high, vandalism is relatively low, for example.